Cummington is a small rural town at the Western end of Hampshire County in the foothills of the Berkshires. 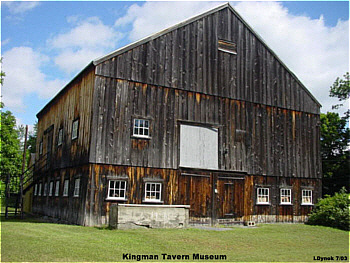 Purchased in 1762 as Township Number Five by proprietor Col. John Cumings of Concord, it was settled in the spring of that year by surveyor Samuel Brewer. In the beginning, the affairs of both the church and town were handled together at town meetings. On June 23, 1779, Township Number Five was officially incorporated as the Town of Cummington. the official organization of the Church also took place at that time and the minister was ordained. It took about ten years of adjustments between the church and the town for the Town Meeting form of government that we know today to be established. During the 1800s, the town was marked by thriving industrial growth due to the rivers and the streams which furnished water power. There were sawmills, grist milklsm, tanneries, woolen and cotton mills, tin ships, a cutlery shop, a wood mill, a blacksmith shop, a shoemaker and a brick maker. there were three Congregational Churches, a Mormon, a Baptist, a Methodist, a Universalist and a Unitarian. In 1830, the population rose to 1,200 people. The Hillside Agricultural Society, a group of farmers from all the surrounding towns, held its first Cattle Show on Main Street in 1869, hoping that this would encourage young men to stay in farming. In the late 1800s, there were 180 farms in Cummington. Today there are five. However, the Cummington Fair is as active today as ever. The Cummington Grange was organized May 25, 1874. It was reorganized November 2, 1900 and is stall active today. Originally the town had ten district schools and the teachers were paid from the taxes. Men were hired for the winter when the older boys, who worked on the farms were in attendance. less expensive female teacheres taught in the summer. During the 1930s, the schools were united at the Union School which was situated were the town tennis courts are today. In the 1950s, the Cummington Elementary School was built. After the town joined the Central Berkshire regional School District, the name was changed to Berkshire Trail Elementary School. 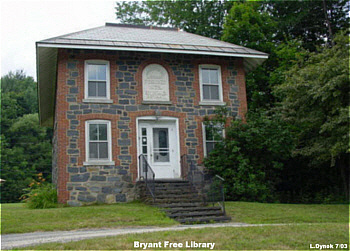 In 1872, William Cullen Bryant gave to the town the Bryant Free Library as well as a home for the librarian. In 1923 the Community House was given to the town by Worcester Warner. Today Cummington is a town rich in cultural diversity. The town has a number of small businesses ranging from small retail stores to restaurants to contracting to farming to computers to crafts, while many people travel to other places of work, there is a group of people who have chosen to retire or raise their families here. There is also an established group of natives. 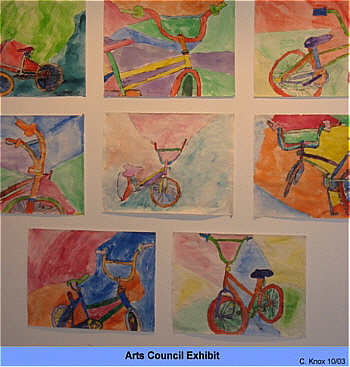 Cummington is the hmoe of two summer camps: Shire Village and the Greenwood Music Camp; the William Cullen Bryant Homestead, the Kingman Tavern Historical Museum and the Cummington Fair. Cummington is a farming and grazing town lying among the Green Mountains, in the northwestern part of Hampshire County, about 110 miles west of Boston. It is nearly central in a large area between the several railroad lines; the Hinsdale station on the Boston and Albany Railroad, about 15 miles distant, being the nearest. It is bounded on the north by Plainfield and Ashfield, east by Goshen, south by Chesterfield and Worthington, and west by Peru and Windsor. 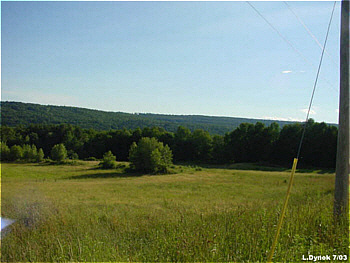 The area is nearly 23 square miles, the assessed land being 13,600 acres. 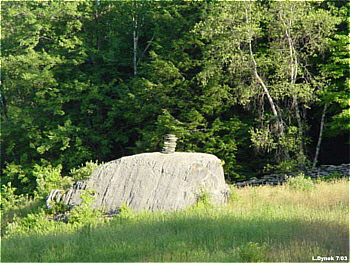 The geological formation is calciferous mica-schist and the Quebec group. Cummingtonite, a variety of hornblende, is found here in mica-slate; rhodonite, or manganese spar, in masses; and white pyrites and garnets. Parallel mountainous ridges run southeasterly through the town; and through the intervening valleys flow the Westfield River and parallel tributaries that enter it when it has taken a southward turn. Swift River comes down from the north and joins the Westfield River in the eastern part of the town, where is located the village and post-office called "Swift River," formerly "Babylon " post office. Near the centre of the town, on Westfield River, is Cummington village, and on the same river, at the extreme northwest, is West Cummington, where an iron bridge, 100 feet in length, spans the river. At these and other points are small mills. There are in the town, paper, wood-turning, grain and other mills, a tannery, and the usual mechanical shops of a rural community. The largest products at present are paper, and penholders and other articles turned from wood; the aggregate value of the manufactures in 1885 being $93,782. 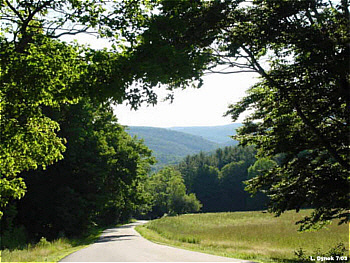 There are 3,972 acres of woodland, consisting of hemlock, beech , birch and maple. Without large ponds, the scenery is romantic. The soil is generally a clayey loam, moist and well adapted for grazing. About the average stock is kept and the usual crops raised. The product of the farms, in 188S, was valued at $91,009. The population at the last census was 80S, of whom 244 were voters. The dwellings in 1870 were reported as 223, with 180 farms; in 1885 the returns give but 107 farms and 186 dwelling-houses. The young people abandon the hill farms, and the passing away of the aged owners leaves them to become a part of the wilderness again. The valuation in 1888 was $313,604, with a tax-rate of $17.80 on $1,000. The town has eight school buildings, valued at about $4,000. There is a town-hall, and a free public library of some 6,000 volumes. 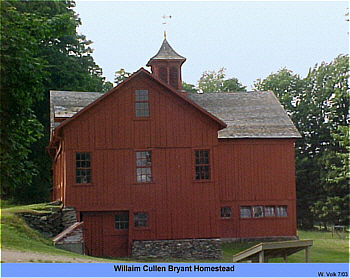 The nucleus of this library was presented by William Cullen Bryant, who was a native of the town. Other eminent men, natives of the town, were Thomas Snell, D.D. (1774-1862), clergyman and historian; Luther Bradish, LL.D. (1783-1863), a lawyer of learning and eminence; and Henry Laurens Dawes (1816), United States senator. 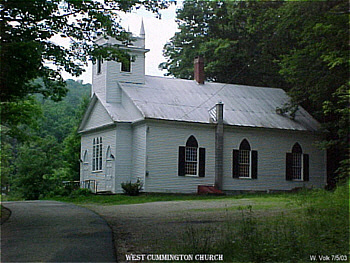 The Baptists and Universalists each have a church here; and the Congregationalists have one at East and one at West Cummington. This town was sold by the General Court to Colonel John Cummings in 1762. 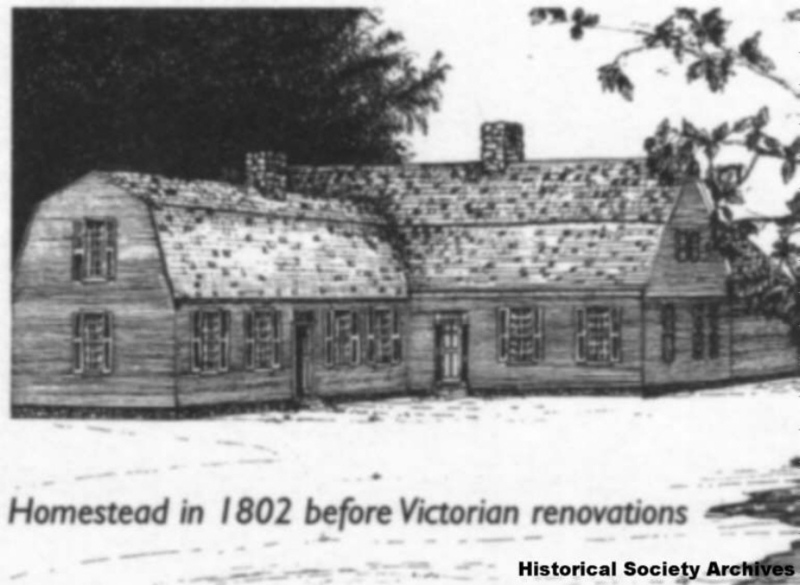 The first settler was a Mr. McIntire from Scotland, who moved into the place in 1770. 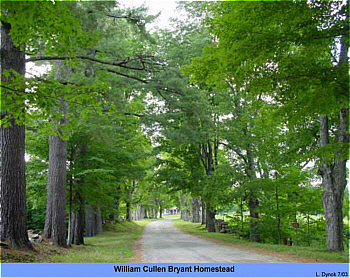 Many of the early settlers came from Bridgewater and Abington; and among them was Dr. Peter Bryant, father of the poet Bryant.